Sphere with dot shading and shadow. Left: Completed sphere. 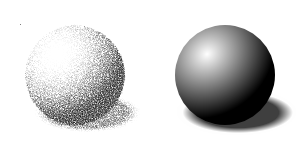 Right: Sphere with gradient shading and shadow used as input for tile cloning a dot via the Trace tab of the Crea Cloni in Serie dialog. The Luminosity (L) was picked from the drawing and used to control the Presence and Size of the dots. A random value was included on the Shift tab.